We validate parking for 2hrs. Welcome to Hickory & Hazel where we present southern sourced, seasonally crafted flavors. Chef Blake has used his regional heritage to allow you to experience something unique with his locally farmed offerings. From the coastal low country to the Blue Ridge Mountains, our menu brings to life the local flavors. Our hope is for you to leave anticipating what you will discover on your next visit! Food was surprisingly good for a Hotel environment. Prices reasonable. Portions and quality both excellent. Had a Wonderful dinner celebrating a friend's Birthday! Food and service was super amazing. The hotel and restaurant has amazing decor. Simply can't wait to return. We came for breakfast, but it ended as they were preparing our table. However, everyone enjoyed their food. Our server was friendly and accommodating. We will return for breakfast. Desserts were worth the value! Mac and cheese was clutch. Aps were not worth the dollar, as there were only three or less. This is a great place for 5 or less people, not set up for large parties, size of place or service abilities. Great service - Great food! A very pleasant meal before going to the airport. Nice ambiance. we really enjoyed our time at this hotel restaurant. we were celebrating 3 birthdays in the family, so they seated us in a semi-private area. the food was great and the service was attentive, but the food was REALLY, REALLY slow. much slower than the last time we'd eaten here, about 4 months ago. Horrible service. Had a large party for a business meal, and 4 out of 6 had to leave before the food ever arrived. Waitress was nonexistent. It took an hour to get three sandwiches, with the restaurant half full. Our waitress was kind enough to remove 50% from the bill, but it put stress on a business discussion. Stopped in for a late dinner.. service was great - menu was varied! Good beer list and although the wine that I picked was out, there was a decent substitute..
Great food, so many great entrees to choose from. A must if you visiting. Minutes to add bacon to a burger. Appreciate Marriott attempting to give good food selections for that area. Celebrated my Mother’s 30 year anniversary of working for still the same company. That’s true loyalty there. Incredible night, food, and company! Thank you so much Hickory & Hazel staff for making tonight extremely delicious and joyful. Mom and I had a great time and will definitely be back soon. We were the second group to be seated with dinner reservations at 6pm for 2 people. We waited 10 minute or more to meet our server. We ordered water and appetizer immediately and then main meals shortly afterwards. Everything took forever; our food didn’t come out until 7 and it was incorrect. We are too tired and hungry to send anything back. They did take $5 off a $60 bill but i doubt we will be back as this is our second trip here with similar results. The Shrimp and Grits are awesome if you do go and the peach tea is nice also!! I had a group dinner of 12 people for a sales meeting and was able to get a table for the time we needed. I would have given a higher rating but it took an extremely long time to get our apps and main course. The wait staff was friendly and pleasant to deal with. The food was also very good. The manager was very apologetic and took 10% off our bill which I expected him to do. Sometimes you have bad luck so I would not discourage people from going because things change and you have to give people and things a second shot. Good food and good service as usual. Service was polite, but not at all attentive. Not recommended except perhaps for apps. If you're stuck eating at the airport, it's not the worst option. But it's a hotel restraunt, and it tastes like a hotel restraunt. Could have been worse I suspect if it was inside the airport, but not too much better than that. Quincia was a fantastic waitress! Food was amazing and service was even better! I met my manager for a business review. The server was respectful of that and did a good job of not coming by too many times but still gave us attention. Food was good but I was disappointed in the variety. Validated parking was appreciated. Wow! This is some playful southern cuisine. Elevated but still homey, modern but true to its roots. This menu and kitchen in a roadside tavern would be screaming out James Beard award, yet it's right here in a contemporary airport hotel. I knew I was in for a treat when I saw the local police chief enjoying dinner...not just another stop for a business traveler. I had the very rich take on shrimp & grits and it was sinfully delicious...low country taken uptown with a creole spice. The fried green tomatoes were perfectly executed and came with a nice corn salad with arugula. The red velvet ice cream dessert was divine. It was a DJ night so the music was pumping but I needed the energy to power through all these flavors. What fun! My business group has been to Hickory & Hazel a few times. We've enjoyed our experiences each time except for our last outing. The food is solid (particularly for a hotel restaurant) and the pricing is fair. The last experience left us scratching our heads though. 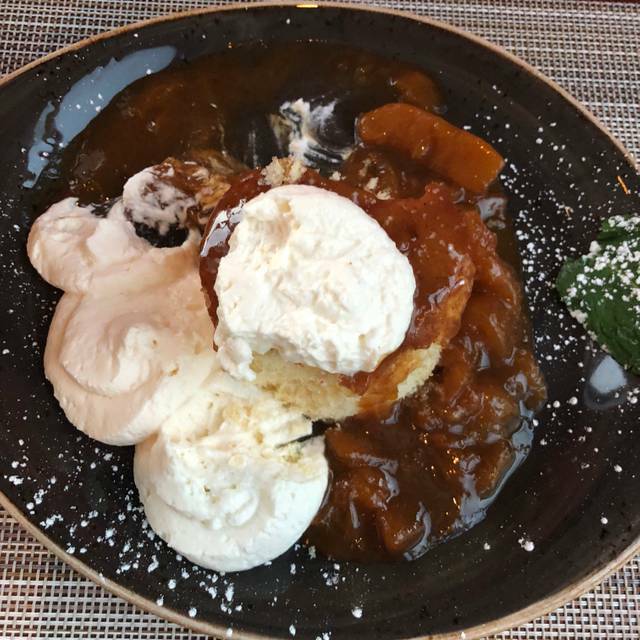 While there were five of us, each on separate expense accounts, the complications to our billing were stated at the beginning of the meal in an effort to help the server keep things as organized as possible. We placed our order and when the food arrived one of my colleagues noted to the waitress that the meal she ordered looked nothing like the same item she ordered on a previous outing there (it was also later added that the meal looked nothing like the same menu item on the two tables beside of us that ordered the same thing as well). Eventually, that meal was removed from the bill but it probably should have never come out of the kitchen in its state. The rest of the main courses were good and correct but dessert was incorrect and items we ordered from the menu were not available and replacements were given without asking if we would like them. Specifically, the banana pudding on the menu was subbed with vanilla pudding without a mention. The worst part was the bills. Three of the five were incorrect and, after waiting an astonishing 45 minutes to get them, we couldn't wait to correct them. I, myself, had three items on my check that I didn't order. Since we were on accounts and the server was difficult to find and was obviously not interested in fixing the checks, we decided to just pay and leave (although it put me over my daily limit and some of that I had to cover). I will go back to Hickory & Hazel as the food is good, the space is attractive and there is a limited number of quality restaurants in the area surrounding the airport but I will be much more cautious with food and my bill moving forward. I could not give it a 5 because the service was just average. We had to get help from multiple servers as ours either wasn’t there or ignored us. It took us forever to get the bill and to get checked out. For what you get it’s more of a $11 breakfast and not the price we paid but it was good. Just a note that parking is valet but they do validate up to 3 hours. I would fly back to Atlanta just for The quinoa salad! Great food and service! The Chicken and Waffles was AWESOME!! Very convenient spot prior to returning to ATL for a flight. Overall very good. Excellent service. The food was just ok. The service was good. Located in the Renaissance Hotel, this is a convenient option if you are staying there or at another local hotel. Interesting Southern Fare, that was well done. My wife and I both had shrimp and grits and would have no issue ordering that again. Blah, so I will start with the good parts, service, ice tea, and fresh fruit. Everything else is lacking. So the pork chop was a dry as Phoenix in the summer. The meatloaf was undesirable even for a meatloaf connoisseur like myself. Normally open table (99 out of 100) steers me in a right direction and helps discover some true gems, but this was the 1 out of 100 that was lacking. Sadly, I would avoid if at all possible.